Hello everyone! It's Saturday and time for another sketch from the Sweet Stop. I think this is my favorite sketch so far! I just know I will refer back to it again. I had such fun making this card. Using my Cricut Expression and Elegant Edges cartridge I cut out a scalloped oval in Whisper White cardstock. 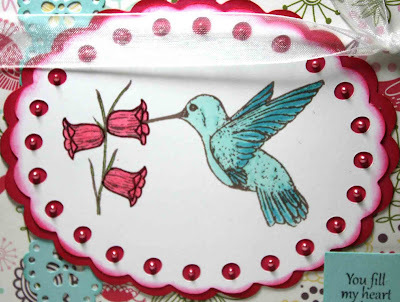 I stamped the hummingbird tulip image from the "Joyful Heart" stamp set from Sweet n Sassy stamps onto the white oval and colored it with Copics. This was then mounted onto a Melon Mambo cardstock scalloped oval. I inked the edges with Melon Mambo ink and then added Flamingo Liquid Pearls in the center of each circle. Here you see a close-up of the sentiment from the "Joyful Heart" stamp set as well as a closeup of the scalloped border I cut using the Cricut and Elegant Edges cartridge. The border was cut in Pool Party cardstock and then accented with Peacock Liquid pearls. Designer Paper: Echo Park "springtime"
Stamps: Sweet n Sassy "Joyful Heart"
Be sure to visit my fellow Sugar Babies to see what they did with the sketch and then join us at the Sweet Stop to play along and link up your creation. Thanks for stopping by today! I truly appreciate your visits and comments. Your card is very pretty. This is a fairly simple sketch. I like simple. I like most of the Sweet Stop sketches. Thanks so much for sharing. A fantastic card for a fantastic sketch. A georgeous colour combination which super slap-uply matches the motive with the little hummingbird. I like the loving details with the little half pearls very much and the saying matches the card well. P.S. And I really like those Sweet Stop sketches. 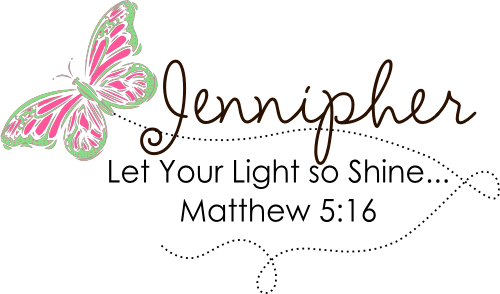 Beautiful, Jennipher! Love the colors and papers you used to highlight this sweet hummingbird image! I always forget about using my Cricut for creating borders and labels...thanks for the reminder! 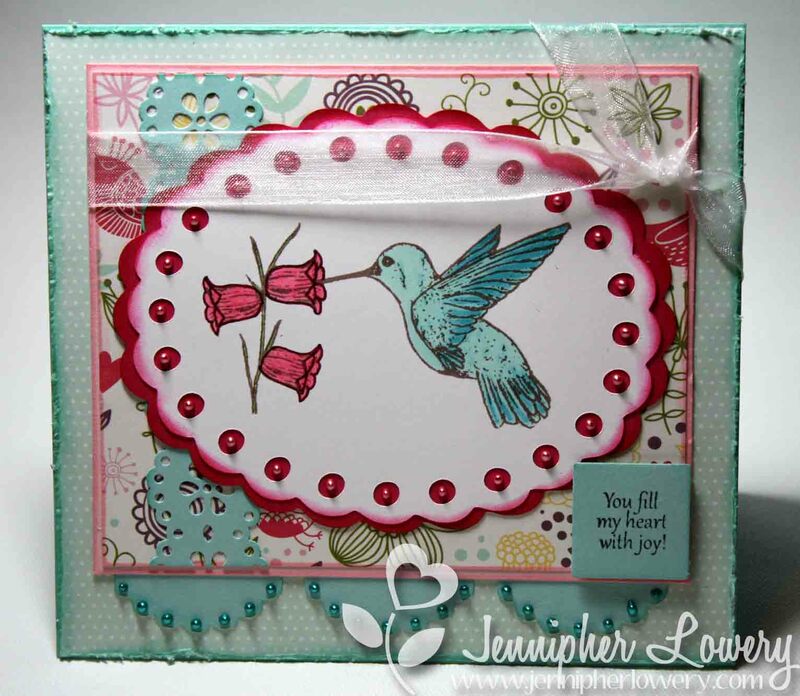 Hi Jennifer, This card is so lovely. The colors are so soft and delicate yet the red pops nicely against the white. Beautifully colored image. Another awesome card Jennipher! Love the colors & that sketch....all your detail on this creation is just wonderful! TFS!!! Beautiful card Jenn!! your hummingbird is just gorgeous. I am so happy you are back and wish your mom a speedy recovery. Such a lovely card! The hummingbird is gorgeous. Love everything about this. What a beautiful card Jennipher. 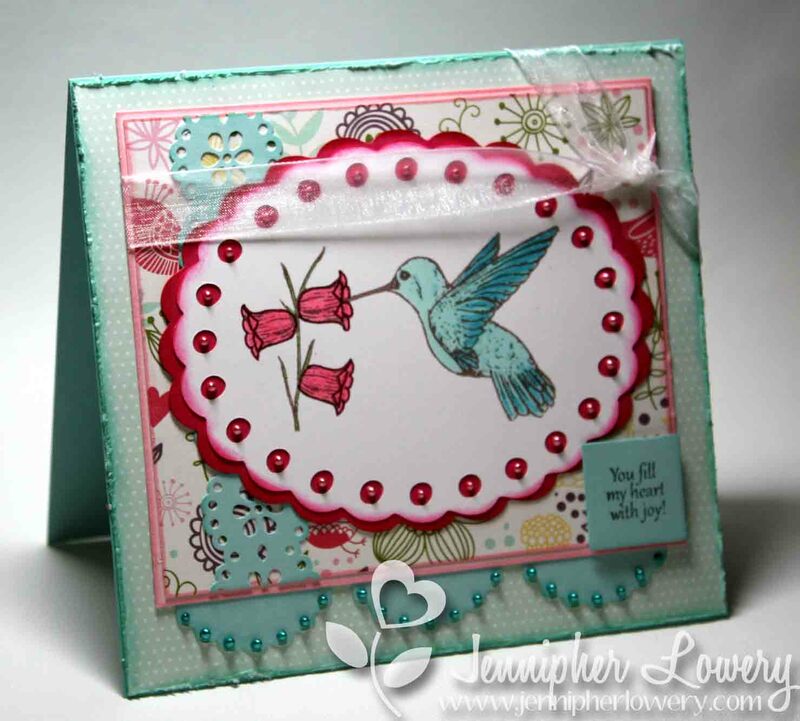 Love the lovely image, the oval instead of the square... pretty embellishments! Wow, this is beautiful! I love the pop of red against the soft blue and all the pearls add the perfect finishing touch! This is so pretty! I love the hummingbird. This is so pretty and love the the oval with the hummingbird on it. Very elegant. Hope your mom is doing well, I say a prayer everyday for speedy recovery. Very pretty Jennipher! I like the way you used the liquid pearls. This is beautiful! Love all the little details and the hummingbird of course. What a beautiful hummingbird card. The layout is just perfect Jennipher. So sweet!! Love the color of this blue and the lil hummingbird is just as sweet as can be! Your card is so pretty! I love the humming bird and the pretty colors. WOW this is gorgeous!! I love that image and your fabulous colors! The liquid pearls is a beautiful touch!